THE ADVENTURE OF YOUR LIFETIME, STARTS HERE! We specialize in paraglider pilot training and paragliding continuing education. Our educational programs in Santa Barbara and around the world are renowned for their organization and execution. Our history in continually bringing together the top paragliding instructors in the sport to work as a team is unmatched. This team has been educating and guiding pilots safely since the early days of the sport. We strive to continue raising the bar for what is available and possible with respect to paragliding service and education. Honesty, and integrity are core values at Eagle. All the information presented on our web site regarding our school, experience, and staff is accurate. We get 11 year olds, Grandmas and Grandpas, and everybody in between flying solo within the first few hours of the initial training. Imagine your first day attempting to surf, and being able to stand up getting minute long rides within a few hours of starting. That’s what you can expect with Eagle’s 1 Day Training at the best paragliding flight park in North America. 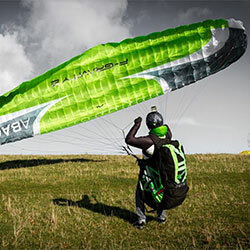 The Eagle Paragliding Online Paragliding Store processes orders in 24 hours Monday thru Friday. We offers free shipping in the continental United States for orders over $100. You can expect the same unmatched service we have been providing our students for years. 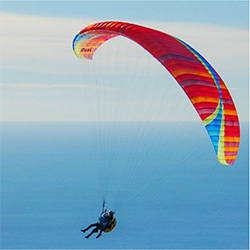 Our full service brick and mortar paragliding shop is ready to handle all your paragliding equipment service needs. Our elite team of certified USHPA Tandem Instructors look forward to sharing your first paragliding flight with you. We have been operating year-round seven days a week for over two decades. Tandem flight can be enjoyed by anyone under 260 pounds of any age. There is no prior experience necessary. These scenic flights are a unique life experience. 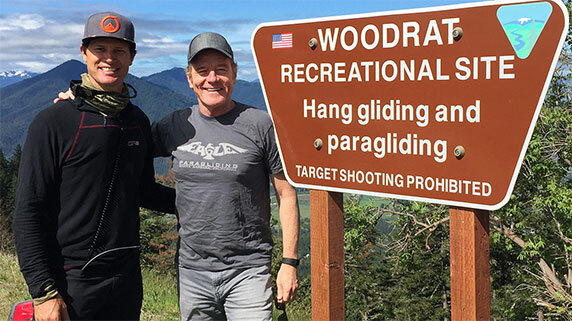 Eagle Paragilding got the call, and our team is grateful to have been hired as the paragliding unit for The Upside Motion Picture starring Bryan Cranston, Kevin Hart, and Nicole Kidman. Bryan was jazzed to fly, and wanted more. He has a place here on the South Coast, so don’t be surprised if he shows up at the flight park for some airtime. He is rocking the Eagle Paragliding T-Shirt available at The Online Eagle Paragliding Store. 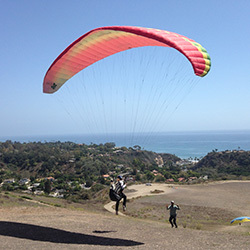 MSNBC visited Santa Barbara for a 1 Day Paragliding Training session with Eagle Paragliding. 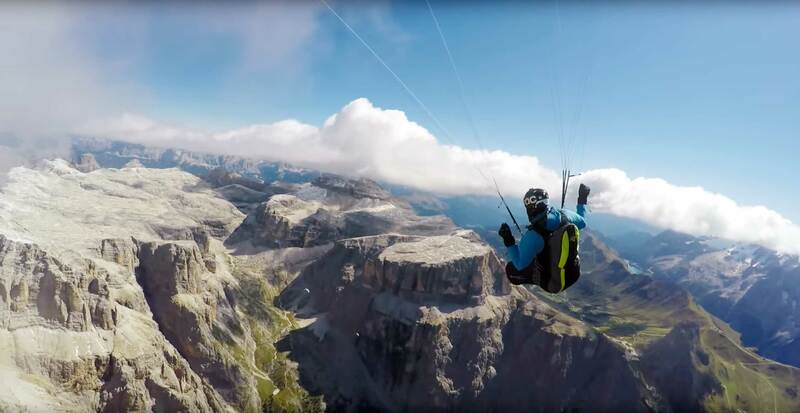 Johnny had no prior paragliding experience, and he enjoyed multiple flights on his first day. Groups of families and friends are absolutely amazed at how easy it is to fly solo within a few hours of showing up for training. View the video of his training session to see how quickly Eagle students are able to take flight enjoying a birds eye view of the Pacific Ocean and Channel Islands. Copyright © 2019 Eagle Paragliding, Inc. All rights reserved. FREE SHIPPING for orders over $100 and $10 flat rate shipping for orders below $100.